The Central & Wolfe Project is located at the southeast corner of N. Wolfe Road and E. Arques Avenue adjacent to Central Expressway. 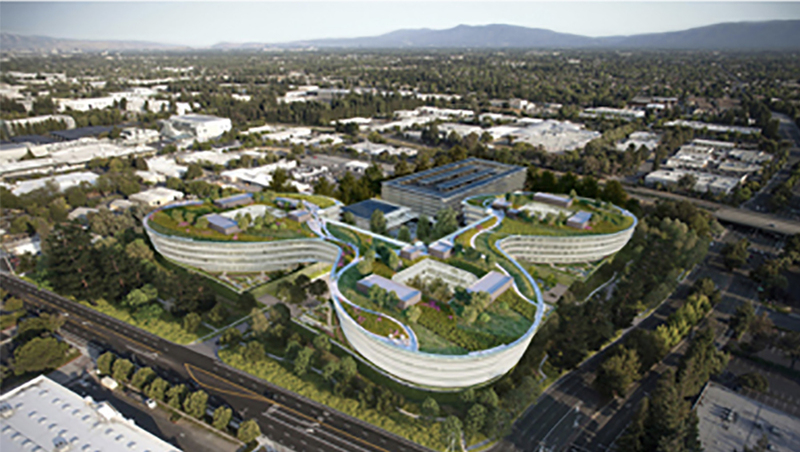 The project consists of an office complex situated on 17.8 acres that includes three interconnected four-story office buildings (totaling 770,000 sq. ft.) over two levels of parking, a six-story parking garage and a central plaza with 30,000 sq. ft. of commercial amenities. The building architecture incorporates extensive glass surfaces that are integrated into a curved building. The approved project includes an increase in the allowable Floor Area Ratio (FAR) from 35% to 100% and the abandonment of the right-of-way for Santa Ana Court (which was created when the surrounding properties were subdivided). The City entered into a Development Agreement with the developer which resulted in additional community benefits. The additional community benefits include additional funding for affordable housing, improvements to Central Expressway and other beautification projects.